Garden Organic as the lead organisation is working together with partners, Capital Growth, the Soil Association's Food For Life project, the Royal Horticultural Society (RHS), School Food Matters and Trees for Cities. The project is supported by the Big Lottery Fund and the Greater London Authority. The project aims to cultivate young people’s love for learning, and hunger for knowledge, and develop supportive and healthy local communities through food. 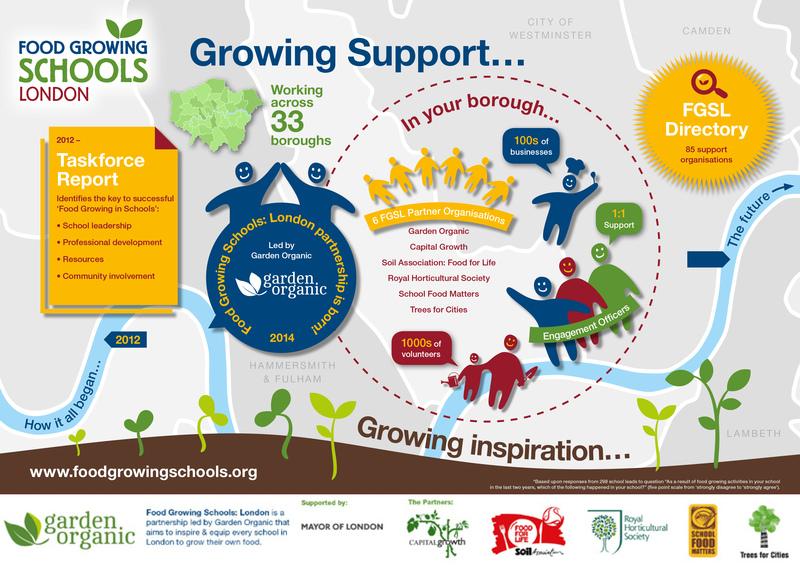 Garden Organic - lead partner, with extensive experience working with schools for over 20 years. Capital Growth - created an Olympic legacy of 2012 growing spaces in London, with 700 in schools. Food For Life - delivering school food award schemes, with 112 London schools awarded bronze and above, and 22 silver gold to date. RHS Campaign for School Gardening - providing teacher and volunteer food growing CPD training. School Food Matters – encouraging school enterprise, with school sales at Borough Market and Whole Food branches. Trees for Cities - creating outdoor spaces in inner city schools through the Edible Playgrounds project. Garden Organic is the UK’s leading organic growing charity, dedicated to researching and promoting organic gardening, farming and food. We have been bringing the benefits of gardening to schools, big and small, for over 20 years, helping students and communities access the benefits of growing food and engage in hands on, practical activity. We do this through our training, project work, volunteer programmes and inspiring demonstration gardens at Ryton, near Coventry. As a partner in the Food for Life Partnership our education programmes, training and resources help teachers and school professionals to embed food growing as part of a whole school approach. Capital Growth runs a network for community food growing projects in London, providing advice, events, training and other support. We currently have over 700 schools in the network, many of which have received funding, entered our competitions or have received other types support and advice. We also run annual events such as Edible Open Gardens Day, urban Food Fortnight and the Big Dig which all members are encouraged to get involved in to raise the profile of their project. Food for Life is about making good food the easy choice for everyone and a Food for Life Schools Award is a brilliant way to demonstrate that your school is doing fantastic work to provide healthy school meals, great lunchtimes and food education that has a positive impact on both pupils and the wider community. Our great value awards packages are designed to support your school through any changes you may need to achieve this. They are based on a flexible framework so every school can approach their award in the way that works best for them. These are available either to schools directly, or via a local authority commissioned programme where they are further enhanced by training and local 'on the ground' support. The RHS Campaign for School Gardening aims to encourage and support schools to develop and actively use a school garden. As part of the Campaign we provide teachers with resources through this website and an extensive programme of Continuing Professional Development (CPD) days. School Food Matters is a charity based in London. With selected partners we devise, develop and deliver food education programmes with an enterprise theme for schools. SFM's approach has always been to work in partnership to develop a programme that can grow and become a firm fixture on the school’s calendar. All programmes will include hands-on cooking and food growing and will often include a visit to a working farm and by joining our membership for schools you'll be first in line to participate! Trees for Cities is an independent charity that works with local people to transform urban spaces in cities across the UK and overseas. We strengthen communities through volunteering opportunities and inspiring children to grow and eat good food and to connect with nature through the Edible Playgrounds programme. Edible Playgrounds transform school grounds into vibrant, functional outdoor spaces that excite and teach children about nature and growing and eating healthy food.